Still no rain. I was awake for part of the night as my mind wrestled with extending my Visa. I call American Airlines and it will cost me $535 to change my flight. I hold off. By 7:30 am, I’m off to the bus terminal. Debbie is waiting for me but no sign of David. We decide to take the 8:15 am bus to give David a chance to show up. Debbie tells me that she’s just witnessed two pigs being slaughtered in the walled off area next to the bus terminal. I take a look and sure enough that’s what’s going on. There’s a very large black and white pig lying there next in line. People come out carrying pails of body parts. A dog sneaks in to grab some pieces lying on the ground. Fortunately the bus is ready to leave. 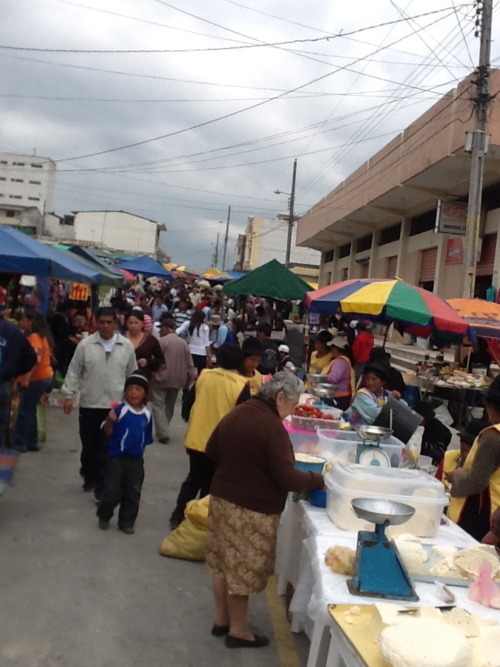 We almost miss the stop for the market in Loja. There are vendors lined along two streets selling all kinds of fruits and vegetables, cheeses and of course meat. Broiled Guinea pigs are available also. We take a cab into the center of town where I get passport photos done before going for lunch at a mexican food restaurant that Debbie came to re-experience. The fish soup has a whole fish in it and it’s delicious. I pick up my photos and we go to another very large indoor market. The top floor is all clothes and shoes. The jeans are piled high in these small stalls. Same with the shoes. The lower floor is like the outdoor market with a sea of food. There is a lot of traffic and we decide to catch the bus back to the clean air and quiet of Vilcabamba. I stop by the lawyers office but he’s not there. There is a sense of relief because I am feeling the doubt still. I drop off some stuff at the house and head back into town in time to sit with Susan, Roxanna and Hunter. It feels like summer as the sun starts to go down. I sit with David as he enjoys some Chinese food. Before his meal arrives, we are joined by Thomas. Thomas I discover is world class photographer who’s worked for national geographic. We head over to Roots for dessert and Thomas shows David a couple of photos he took of David. They are stunning works of art.